Justin Portal Welby was enthroned as the 105th Archbishop of Canterbury on 21 March, the feast day of Benedict Abbot of Monte Cassino († 547) and Thomas Cranmer, Archbishop of Canterbury (†1556). 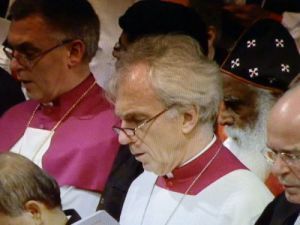 The Union of Utrecht was represented at the ceremony by the Archbishop of Utrecht, Joris Vercammen, as the Chair of the International Old Catholic Bishops’ Conference, and by Dirk Jan Schoon, Bishop of Haarlem, as the Co-Chair of the Anglican–Old Catholic Coordinating Council (AOCICC). The many ecumenical guests were invited to a reception at the Canterbury Heritage Museum the evening before the enthronement. First of all they attended a presentation on the role of the archbishop as the Primate of All England and the head of the worldwide Anglican Communion. At the buffet afterwards they had the opportunity to meet old friends and make new contacts. The area around the cathedral itself was completely sealed off. On the day of the enthronement the guests were taken into the fenced-off area to get changed before the ceremony. Each group was assigned part of the crypt for this purpose. The Old Catholic delegates shared a side chapel with guests from other churches with which the Anglican Church is in communion, including the Porvoo Churches and the Mar Thoma Church. The cathedral gradually filled up with the guests and congregation. Once all of the participants in the various processions had found their places, the Prince of Wales and the Duchess of Cornwall arrived and the service could begin. 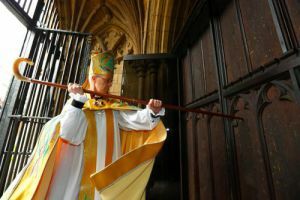 After the reading aloud of the enthronement mandate, the new archbishop struck the door of the cathedral loudly three times with his crozier to request entry, which was granted by a teenage girl. The Dean then presented Justin Welby with the ancient Canterbury Gospels, on which he swore faithfulness. The enthronement ceremony itself took place after a brief Service of the Word that included readings from the Book of Ruth and St Paul’s Second Letter to the Corinthians. Archbishop Welby was led to the Diocesan throne, where he was given his pastoral staff. He was then installed on the chair of St Augustine as Primate of All England, and welcomed with deafening applause. After the Peace and a Gospel reading, he gave a sermon on hearing Christ’s call and responding to the risks that emerge for the church. “Many Christians are martyred now as in the past,” he said. In keeping with Anglican tradition, the service included stirring organ music, hymns and choral music. Slightly less conventional, but no less rousing, was a welcome dance performed by African dancers and drummers. In the evening, hundreds of guests were invited to a dinner at the University of Kent hosted by the Nikaean Club, which organises all large-scale receptions for the Archbishop of Canterbury. This once again provided plenty of opportunities to talk to new and familiar faces. On the following day, the new archbishop welcomed the many guests at a reception. 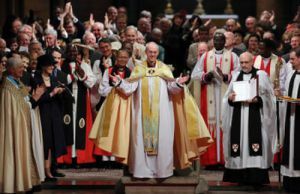 Archbishop Vercammen congratulated him on behalf of the Old Catholic Churches, which hope and pray that Archbishop Welby will receive God’s blessings as he serves the Church of England and the worldwide Anglican Communion in the years ahead. His installation was a magnificent event that demonstrated the strong support that he will receive as Archbishop of Canterbury from all over the world.